Wax anatomical model of a human head, posibly German, 19th century. 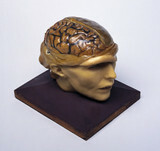 Wax anatomical model of female human head showing internal structure of skull, German(? ), 19th century.